But none of that seemed right to me. Then I had the idea of a shelf, but wasn't sure how to execute it easily. So I Googled "over the door/window shelf" and came across this image. I purchased two rod brackets with flat tops at Lowes for $25. Then Mr. Rosemary Lane picked up a 6" X 8' primed board for roughly $12 and it fit perfectly on top of the brackets. All we did was secure the shelf to the brackets with a little wood glue. This could not have been easier and I love the way it looks! 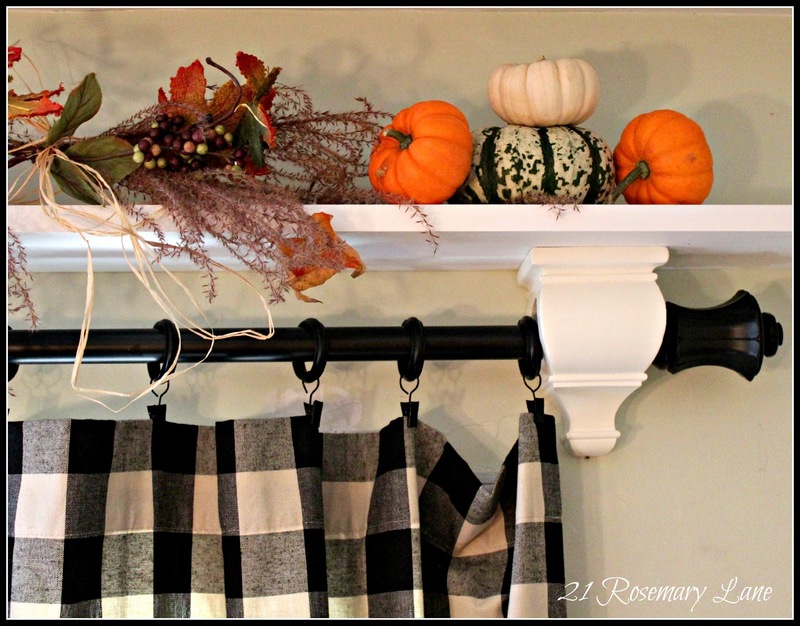 For just under $40 I now have a great space to display seasonal garlands, fun treasures and collectibles. What would you display on a shelf like this? I would love to hear your ideas! Barbara I love it!! My dad made so many of those for my mom. She had them over some of the large windows in their house. Barbara, this is the cutest thing ever! The two of you are quite the team! It looks so pretty all decorated for fall! Oh, I bet you have ideas swirling for the holidays! Oh, I LOVE it! Of coarse, I love the fall decor on it. You can do something for every season. You may have just started a new trend. What a wonderful idea. It looks so pretty and of course you have staged it beautifully. It's a great idea. I had my hubby make them for over our bedroom windows at our last home. Just make sure nobody slams the door and a pumpkin comes tumbling down. Love the display! Oh Barbara that is one clever idea. Your shelf looks fabulous! Barbara... this is such a fabulous idea... and so easy... and really decorative! Great post!!!! 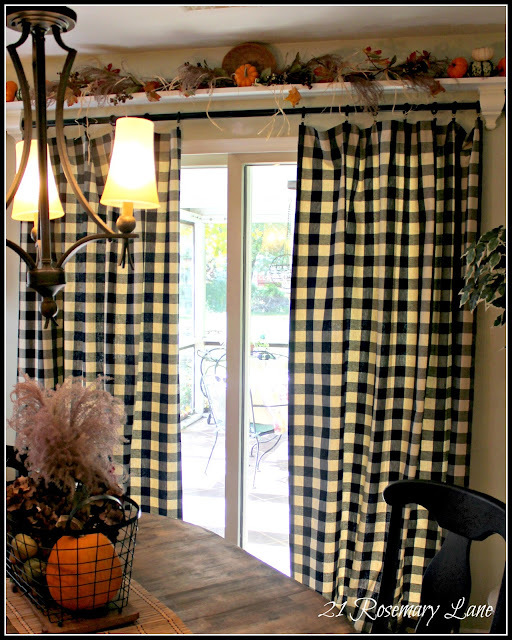 I love your black and white check curtains with your festive fall decor! It all looks so lovely and I am really digging your plaid curtains! Thanx for partying at THT! I love the shelf over the windows, and your black and white checked curtains. It just add the perfect amount of decor space above your sliders! 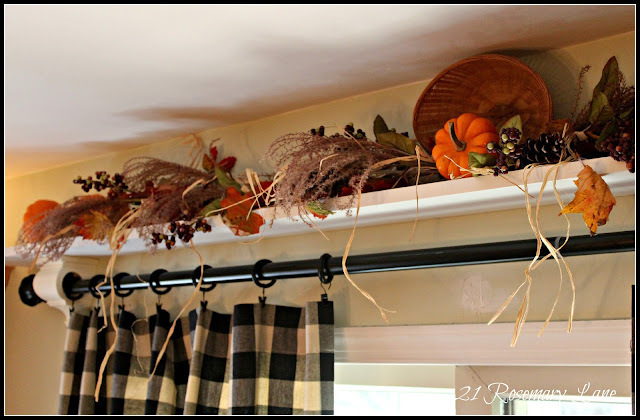 I look forward to see all your decor for the different seasons! so gifted! I MUST put this on the Headmaster's agenda for spring! I just found you through Stone Gable, and am your newest follower! My wife will love this! 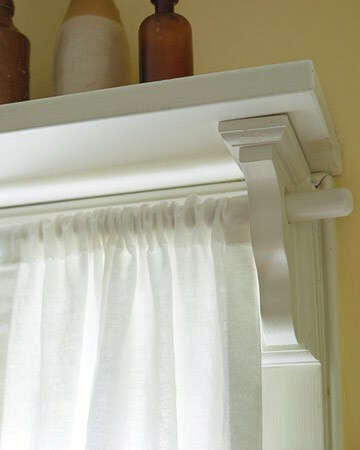 That is such a smart idea to put a shelf above your curtain rods! Plus you can decorate it according to the seasons and holidays! Very smart idea. My wife has been looking to buy decorative shelves so she can decorate it for the fall season but maybe I'll show her this first. Thanks! Love the shelf over your patio door. I see this project in the future for my patio doors. Love your rooster plates too. I love what you've done with this I've been looking for a place to buy decorative shelves. So thank you for the blog. Put these in my kitchen along with an outlet and switch. We decorate it for each season and with the miniature lights it looks so wonderful. 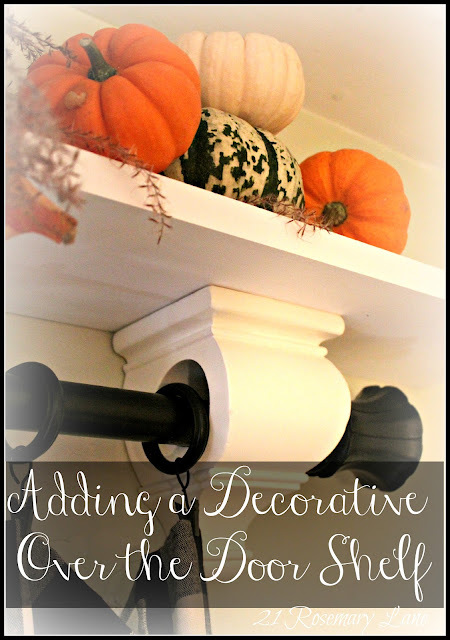 Where did you find the wood sconces that the shelf is on? Hi Kelley,...I actually found it at either Home Depot or Lowes. It wasn't that expensive if I remember correctly. Maybe $25.00 or so. I love the design. I just can't find the curtains. Where did you get them? 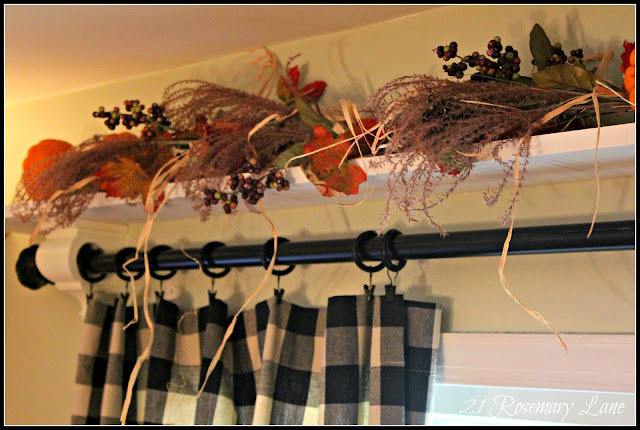 I was in search of an above-patio door and above any door shelf. I found yours. FABULOUS. I was even more motivated so off to Lowes I went to find the flat wooden/plastic curtain brackets. They have none. Help? I'm stuck now in doing this project. Please redirect me as to where I can find the flat brackets. How can I purchase one of your shelves? 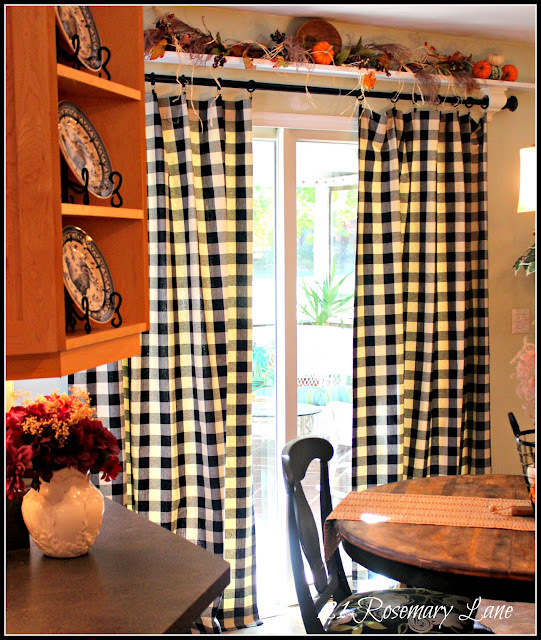 I saved your blog post here showing the window top shelf and those beautiful buffalo check curtains. I'm sure you posted this sometime ago....but....any chance you could share where you purchased those curtain panels? I have been searching everywhere for panels that are as pretty as yours but NO LUCK. Thank you for any leads on this. I am going to hang them at the slider door leading onto a deck.